Come and Paddle the Stunning River Wye in a memorable and challenging event on the River Wye. Two days of fun, splashing about, and hard physical work paddling you, your boat and your gear down the River through the wonderful Wye Valley Area of Outstanding Natural Beauty. The River Wye is born on the slopes of Plynlimon and carves its way through mid-Wales and the Marches until it reaches the River Severn 153 miles later. The ruins of Tintern Abbey, the rocky outcrop of Symonds Yat, and the commanding bulk of Chepstow Castle have attracted tourists in their thousands since the 19th century - and with good reason. More recently, book lovers have flocked to Hay-on-Wye, where dozens of secondhand bookshops flourish. Popular today mainly with canoeists, the Wye has actually been navigated since Roman times. Our journey will begin in Glasbury and meander our way gently down towards Hereford by the end of the weekend. We shall spend two nights under canvas, carefully locating our camp sites each evening near to local pubs in the area. 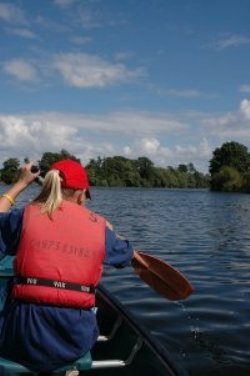 Setting out in our Open Canoes, you will receive an initial briefing on how to manoeuvre and maintain a straight line in your new found mode of transport, and you will find it takes surprisingly little time to master the basic strokes. Whilst it seems pretty easy and straightforward to begin with - after our paddle of approximately 13 miles, you may find it a little harder! Please Note: This is a bespoke challenge for private groups. The guide price is based on a minimum of eight people. Depart 09:00 Latest - Group will move in a group within visual contact of one another with a group leader. Open canoeing is a fairly simple and straightforward activity in its simplest form on flat, calm water. The simple straightforward paddle strokes are easily mastered, and can be picked up in just a matter of a few minutes to those with some degree of co-ordination. The Open Canoe was first put to widespread use in North America and predominantly in Canada. Hence the term ‘Canadian Canoe’. It refers to a type of personal boat ideally suited to exploration and load carrying, with an open contruction. In the past these boats were constructed from hide and stitched onto a wooden frame, but nowadays it is more the norm to see fiberglass or Glass Reinforced Plastic type boats. However, do not be lulled into a false sense of security - this will begin easily, but you have a long distance to cover, you need to pace yourself! 2 Nights of Camping— A certain number of tents are available. Please ask if your require a tent. Saturday night will be spent under canvas—hence please bring a sleeping bag with you, and wash kit and towel. Facilities are simple—ie no showers—but a tap is available. 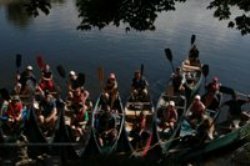 What is a Level 1.5 Paddle Challenge Like? These activities tend to be higher adrenaline challenges - but with lower specific fitness. Examples might be introductory abseils or simple caving outings, or an easy canoeing itinerary. Equally a very easy going introductory multi activity itinerary could be found here. These activities would be suitable for challengers with basic fitness levels, or returning to challenges after some time away. How Fit Do I need to be to join a Level 1.5 ‘Paddle Challenge’? You need to active, mobile, and in good health. You should be used to going out for walks of 2-4 hours on level or gently undulating terrain. Walking should be a regular activity for you - although you only need an introductory level of fitness. You should be doing some physical activity at least once per week. Your guide, your boat hire with paddles, and buoyancy aid. Your camping for the 2 nights (tents and stoves included). Experienced Leader. Breakfasts. Barbeque on Saturday night available to be pre-booked for £6 / head. This price does not include your transport for the weekend – lift share may be available. Lunches and evening meals are not included. Safe place to store Car Keys for the weekend! Being in the UK we should be prepared for anything. Whilst not wishing everyone to bring heaps of equipment we should be prepared for both poor weather and scorching hot weather.Bring both equipment to protect from hot sun, and also to protect in case it rains. It is unlikely to be cold.